Cashew cream is one of those “secret weapon” vegan ingredients that I wish I could share with every person who’s nervous about giving up dairy. It’s so easy to make, and yet it can create a world of difference in vegan soups, pastas, casseroles, cream sauces, and more. There are, of course, many ways to successfully create creamy texture in vegan cooking without the use of real cream. They include silken tofu, coconut milk, vegan mayo, and avocados. But this all-purpose cashew cream recipe is my favorite trick of the dairy-free trade, both for its authenticity and also for it’s mild flavor. It’s a lot more neutral tasting than coconut milk, and I think it comes closer to replicating real dairy or cream than silken tofu does. Cashew cream can feel like a bit of a project if you’ve never cooked with it before, but the truth is that it’s a 3-4 ingredient recipe that takes very little time or effort. A high speed blender makes it easier, but it’s totally doable in the food processor, too. It works in some regular blenders, too, depending on the model and on how long you soak your cashews. Once you have a jar of cashew cream at the ready, you can store it for up to 5 days, using it throughout the week to add silky decadence to all sorts of recipes (more ideas below!). Here’s my all purpose, easy peasy recipe. Place all ingredients, starting with only ½ cup water, in a high speed blender or food processor. Blend or process until completely smooth (the process should take about 1-2 minutes in a high speed blender and about 4 minutes in a food processor). If using a food processor, stop a few times to scrape down the bowl and then continue blending. Drizzle in extra water as needed to reach a desired consistency and add sweet or savory flavorings of choice. Store in an airtight container in the fridge for up to 5 days. *You can use raw, shelled sunflower seeds in place of the cashews for a nut-free version. Pine nuts, macadamia nuts, and almonds will all work with the same amount of soaking time. 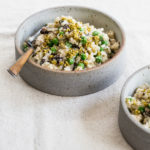 Shelled hemp seeds can also work and don't require any soaking, but you may want to do a 50:50 combination of hemp seeds and another nut or seed to help offset the strong hemp flavor. **If you're using a high speed blender, the nuts will only need 2 hours of soak time. Once you’ve made the cream, the possibilities are endless. Here are some of my favorite culinary uses for it! As you can see above (that’s a simple carrot ginger soup I made, based off of this recipe), cashew cream can work wonders in a soup. 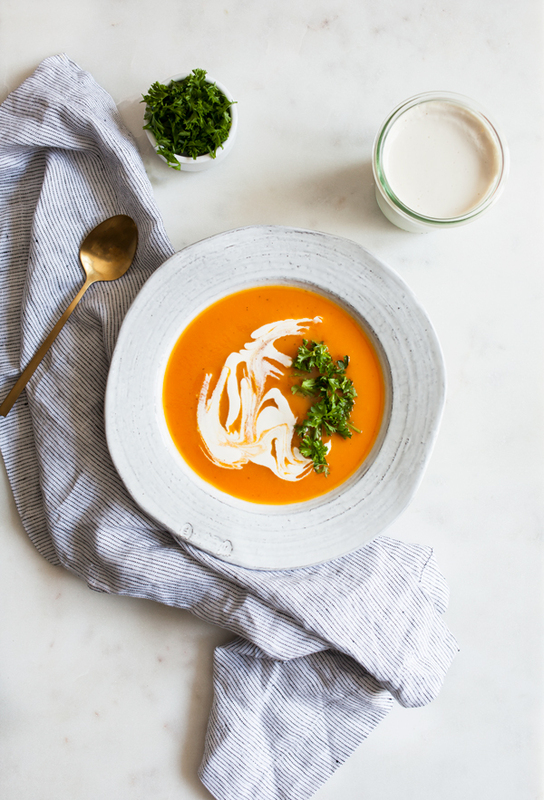 Try it in my cream of broccoli and quinoa soup, my creamy curried cauliflower soup, my minted pea soup, or my roasted cauliflower and parsnip soup. The obvious use for cashew cream in pastas would be a vegan alfredo recipe, but cashew cream can also create a rich tomato sauce, a vegan penne a la vodka, or a creamy pasta primavera. 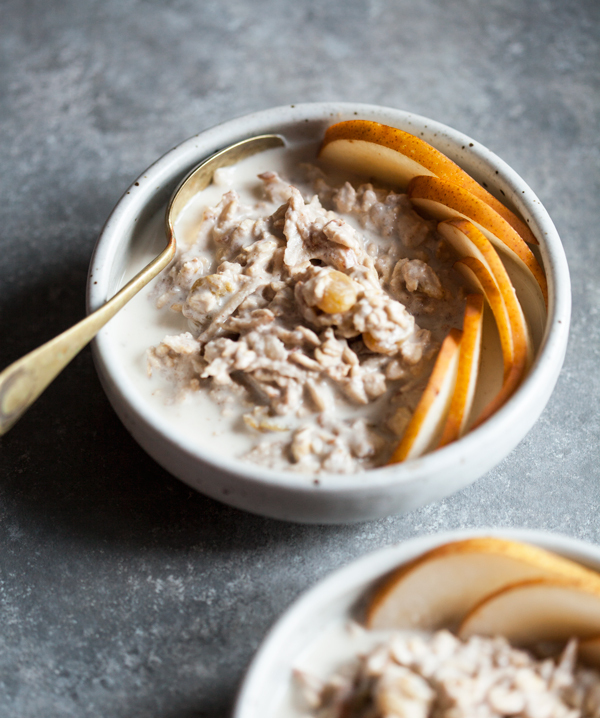 If you love thick, traditional morning muesli and want to create it without dairy yogurt, try using cashew cream (or a mixture of cashew cream and non-dairy milk) instead. This recipe and this recipe can provide some inspiration! I love to stir some fresh cinnamon, ginger or cardamom (or a combination of all three) into a very thick batch of cashew cream, and then use it as a dip for apple or pear slices in the fall. Yum! If you’re looking to make a traditional vegan casserole or gratin, cashew cream is your new best friend. 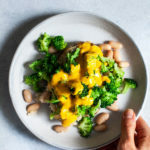 My cheesy vegan quinoa and broccoli bake uses a spin on cashew cream for its base. Cashew cream is perfect for “cheesy” or creamy vegetables sides (vegan creamed spinach, anyone?). 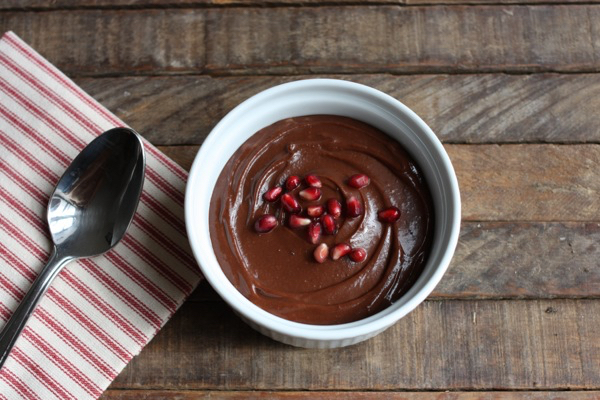 Cashew cream makes silky smooth, decadent vegan puddings (like Fran Costigan’s warm chocolate cashew cream pudding, above) a snap! For mashed potato recipes, I often rely on the tried-and-true combination of Earth Balance and soy or almond milk. But folding in some cashew cream can create mashed spuds that are particularly decadent/dreamy/delicious. 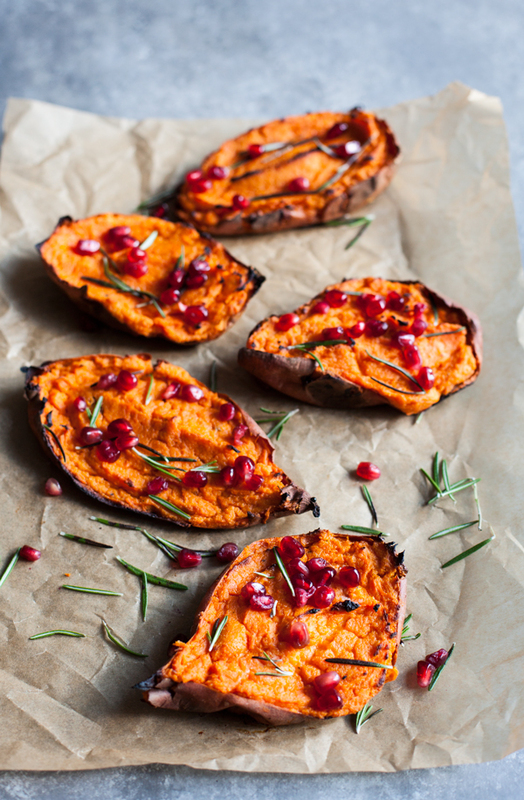 You might also try using cashew cream or cashew cheese as part of a filling for savory twice baked sweet potatoes (you can see my macadamia cheese version of this idea above). As you can see, there are so many culinary possibilities for this humble mixture. If you’re working toward a more plant-based diet, trying to avoid dairy due to an intolerance or allergy, or if you’re simply hoping to explore more vegan recipes and cooking techniques, cashew cream is a great place to start. If you try this recipe, I’d love to hear how it goes–and feel free to tag me on social media if you try it and manage to snap a picture! I agree! Coconut cream makes dairy free more decadent and is a perfect addition to dishes. I loved that you added sweet and savory flavor combos to the recipe! and your photos are gorgeous! I love cashew cream! It is so versatile. Hi & Greetings from the UK. BIG thanks for your fab post, so informative and inspiring. I can’t wait to try your suggestions out. I have given up dairy cream and do not want to sub with coconut cream and milk. This is such an amazing concept and brilliant healthy food swop. Thanks again, look forward to seeing some of your recipe ideas using the cashew cream in future posts. I love this post. Not just because of the cashew cream (which is awesome!) but for all the different ways you can use it. It’s so versatile and is a good way to add extra nutrition to any dish! I would love more people to give it a go, and not just vegans or dairy free individuals. Thanks for sharing! Love the tip about soak time being as little as 2 hours with a great blender. Cashews are amazing. Great recipe! Thanks for sharing. I love cashew cream and I love how you flavored it for both sweet and savory options! Beautiful post. Thanks for sharing this recipe, & especially the tips for using it in all sorts of ways from sweet to savory. I will definitely give it a whirl . Happy spring! I always looked forward to spring blooms, & even though it’s summer year round in Maui, I still miss the feeling of renewal that comes with spring. Cashew cream never lasts 5 days in our home. We put it on almost everything we eat! Valerie taught me how to make cashew cream, and I stick pretty close to her recipe, but I love your variations and will enjoy trying them out! I tried this recipe yesterday and found it worked great! I soaked the cashews overnight and used my food processor. I just kept adding water until I got the consistency I was after (heavy cream). I used it to make a potato/celeriac puree and it worked perfectly. Neither myself or any of our dinner guests could tell that it wasn’t dairy cream. I also made a second batch that I left thicker to make a sweet lemon cream for fruit parfaits (http://gourmandeinthekitchen.com/nectarine-parfait-recipe-with-lemon-cream/). That also worked out well. That one I did push through a sieve after processing to give it a smoother feel since it was standing on it’s own. I haven’t tried it, but I do think it would work in place of the traditional cream! Would love your take on this as a base for a cashew sour cream for use over potatoes, etc with chives. What ingredients could spin it in that direction? A couple of newbie questions about making the cashew cream. 1) soak overnight. Do I leave them on a counter top or put in fridge to soak? What temp water is used for the soaking. Hot warm or cold? 2) can it be frozen and if he’s best way to defrost? Great been looking for DF cream option with cashew nuts. Hoping it will work in my GF Lemonade Scone Recipe. I made this to thicken and “cream” a cream of broccoli soup. It was amazing! I made this with raw sunflower seeds which I soaked overnight. I chose to make the sweet cream adding powdered sugar and vanilla extract. It turned out very nice! I plan to try to incorporate the cream into an almond milk ice cream recipe.